We love RVing and have traveled I-10 across California and Arizona, passing through here many times but until this day, we had not had a Quartzsite experience like the one we would have today. The expression “if you build it they will come” springs to mind and most RV’ers in this part of the country are very likely to have seen or heard about Quartzsite, Arizona. Some RV’ers come to stay here for awhile, parking in one of the local RV parks, but there are many more who ‘boondock’ (being self- contained) out in the desert. The desert may look like this as we drive by but there may be rv’s parked out there and the closer we get to Quartzsite, the more of them we can see. According to Arizona Highway Patrol figures, there are between 750,000 to 1 million visitors, most of whom are RV’ers in the months of January and February, who come to Quartzsite every year. This town, with a population of about 3500 for the rest of the year, is located on I-10 about 30 km (18 miles) from the California-Arizona border and where Highway 95 crosses over I-10. The purpose of our day trip was to visit the Quartzsite Sports, Vacation and RV Show to see all that which might be needed for this style of living, and then some! There are many kinds of RV’s open for viewing at this show, considered to be “the largest gathering of RV’ers in the world”. Many vendors have gathered here for this special show as well as other shows that happen yearly, including Quartzsite Hobby, Craft & Gem Show, which is another big draw to the area and the Quartzsite Rock & Roll Classic Car Show, click here to learn more about these shows. Quartzsite is called the “Rock Capital of the World” and if you were to visit one of the nine major gem and mineral shows held at the nearby grounds, or many other shows held there, you will see rocks of all kinds and understand why they are so named. Rocks also play a big role in the history of this mining town. Quartzsite, Arizona, originally called Tyson’s Well, so named after Fort Tyson, was built in 1856 and served as a safe stop for travelers. The access to water and the location made a place for the stage line to stop, and for miners as well as freighters passing through with mining equipment and military supplies. In 1897 a small mining boom took place and the town of Quartzsite was built about 9 miles east of Tyson’s Well. Quartz is a mineral not found here but quartzite is, thus the name with an ‘s’, apparently misspelled by the Post Office employee, so the story goes, when applying for the town site’s new name. This remained a mining town until the mine closed down in 1957. The camels are significant to this area as a result of an experimental program called the US Camel Corps. Hi Jolly was hired by the US Army in 1857 as a camel herder for the Camel Corps that was to chart a wagon road across New Mexico and Arizona to the Colorado River. The Camel Corps ended when the Civil War began but Hi Jolly kept his camels to continue working then eventually moved back to Quartzsite. Hi Jolly is remembered with an annual parade and a landmark in the Hi Jolly cemetery. Learn more. So went one day in our life of winter RV’ing, a life enjoyed by so many of us. A life that allows us to make impromptu plans, to join some friends at the 'adult daycare', which had great food, beverages and music and spend our day in Quartzsite with thousands of other RV’ers. Oh, what a life! Day 5 of our winter drive south and we are on the home stretch, which will take us almost 5 hours. We will drive 348 km (216 mi) today so arrive early enough to set up in daylight. 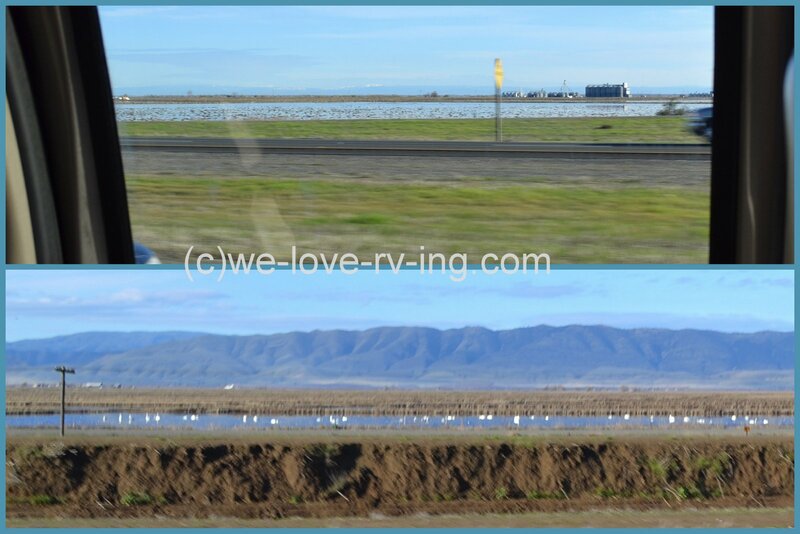 We’ll travel from Bakersfield, CA over Hwy 58 past Tehachapi and the Mojave Desert. Once we arrive in Barstow, we will then take I-15 to San Bernadino, CA where we will then follow I-10 east to Palm Springs, California. We’ve spent the night just east of Bakersfield, CA at the Orange Grove RV Park, where we have stayed and enjoyed many times. A reservation is necessary as they fill up at this time of year with all the snowbirds heading south. The park encourages everyone to pick some fresh oranges from their trees when they are ripe so we shall do that plus a free truck/RV washing is to be done before we leave. The Tehachapi Pass is one of my favorite ones and the sights include the Tehachapi Loop that the Union Pacific Railroad uses to lesson the grade, the track passes over itself on this 1.17km (.73mi) spiral. This in one of the busiest single-track mainlines in the world, which explains why we usually see a train when we pass through here. This photo was taken on a previous trip, we see nothing today. This is what we are really looking at today, the visibility is almost zilch! The Tehachapi Pass is 1156 M (3793’) high and we’re in the clouds at the southern end of the Sierra Mountains. The drive might be a bit slow as we pass through here but the roads are bare. We’ve also had snow through here before but not today. The Tehachapi Pass connects the Tehachapi Mountains with the Mojave Desert, which we will travel through today. Our temperature as we go through the Pass is just over 3C (36f) so not the weather we want to spend too much time in but it tends to be cool like this at these levels, especially at night and through the Mojave. As you may imagine, there is a lot of nothing as we drive across the Mojave Desert but there is one place I find interesting by the road signs. We pass the 20 Mule Team Road which was named after the 20 mule teams that moved borax out of Death Valley, CA many years ago. Then we see the Borax Visitor Center sign that leads to the site a short way off the freeway. After some research, I find that this is the largest open-pit mine and borax mine in the world. Once we leave Barstow, Ca we are travelling on I-15, passing through Victorville, the former home of Roy Rogers and Dale Evans Museum, now closed. We descend down towards San Bernadino Mountains and see some very dark clouds ahead but we’ll be heading east before we get to those. We are now travelling east on I-10 and only a half hour from our favorite RV Park. Upcoming shows are advertised on billboards and we spot this show with Robin Thicke that we will definitely have to see on Feb. 2, 2013. There are several casinos with no shortage of great entertainment in the Palm Springs area. We arrive in the Coachella Valley and the temperature is 13C (56f). Cool temps and clouds are not what we usually expect to be greeted with but we see no snow! The new overpasses have been completed since our last visit and the sign says we’re in Palm Springs and we are only moments from the park. We have arrived at Desert Shadows RV Park, which we will be calling home for the rest of the winter. The gates open up like welcoming arms after a long 5 days of winter travels and we are very happy to be here, clouds and all. We have now completed a journey of 2,414 km (1500 mi) together over the past 5 days. 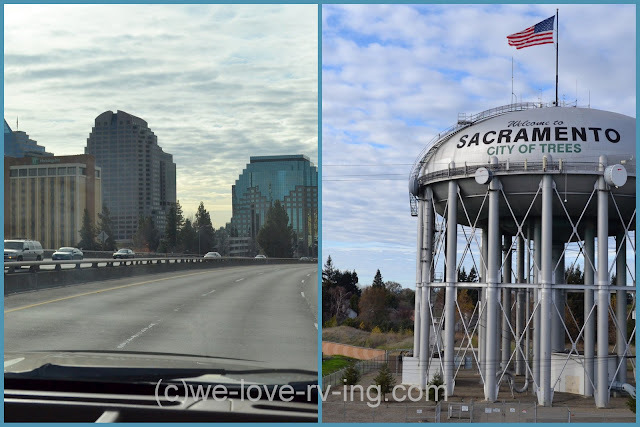 I usually showcase the places we visit and not the roads we travel but if you’ve enjoyed this one, I hope you will continue to follow us on our RV adventures to the places we visit. ﻿A lot more traffic on the roads in Washington and the fog certainly is thick this morning but most are driving according to the weather and the roads are not winter roads. There is a lot of freeway driving on this part of the trip south but most of our time is not done during rush hour as we usually try to time the trip so we can avoid that. ﻿This day was fairly uneventful and with the fog following us most of the day, the scenery was almost non-existent so it wasn’t a big photo day but there were some scenes that looked pretty enough for a photo. This was taken looking into the sun that was just behind these clouds as we neared Portland, Ore., making it look like a black and white photo. ﻿﻿We spent that night in Cottage Grove, Oregon at the RV park adjacent to the Village Green Motel after a good long drive and enjoyed a great dinner in their restaurant. They are just a short distance off I-5 so make it easy to get back on in the morning to begin day 3. I love the scenery south of Cottage Grove and am disappointed we won’t be able to see more but the fog offers some very neat sights so the camera is busy anyway. The roads are damp but the temperature isn’t freezing so they are good travelling roads today. Our destination is Red Bluff, CA tonight so we have a lot of miles to cover that include some mountain passes. We have left early so that we can arrive before dark, which arrives early during these winter months. ﻿Grant’s Pass is just west of Medford, Oregon and is one that concerns all winter drivers as it does get winter conditions and has been known to require chains in order to travel through these mountains. Other than the fog and the threat of snow, we’ve not had any weather problems yet. ﻿The Siskiyou Range of mountains travel along the southern Oregon and northern California border and we don’t usually see snow on our trip south but this year is totally different. We are seeing fresh snow on the trees that border the highway and we’re driving through clouds and we expect more snow. We are climbing higher. The climb has taken us to the highest point on I-5, which is in the Siskiyou Mountains. 1314 Metres (4,310’) is a big climb and although the outside lane isn’t a real one, the shoulder of this road is wide enough for the big trucks to travel and they do so as to not hold up the other traffic. There usually is a sign to say if this is allowed. Consideration in this matter is always appreciated by other motorists. ﻿﻿The thermometer in the truck for the outside temperature reads -2C (29F) so it is cold out there. We call our friends on the two way radios we carry for these travels and make a stop in a Rest Area. We take a break, make some lunch and walk the dogs. These Rest Areas make it easy to get out and stretch, always a good idea every couple of hours and they offer clean restrooms, too. ﻿﻿We’re back on the road in no time and happy to have the mountain passes behind us. The fog is still pretty thick but we know we only have a couple more hours to go before we stop for the night in Red Bluff, CA. Lake Shasta is shrouded in clouds but we’re able to see the marina, not much activity there today. 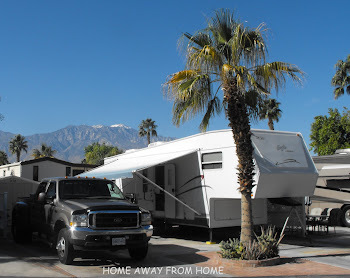 We carried onto Red Bluff, CA and stayed in Durango RV park, also easy access from the freeway and enjoyed a beautiful RV park with nice amenities and nearby restaurants and shopping. We’re not there yet so stay with us and we’ll share some more winter travels. We love rv’ing and the time has come for these Canadian Snowbirds to head south for some sunshine. Not that we don’t have some wonderful winter weather at home, but we also like to enjoy the winter weather that doesn’t include cold temperatures and snow. We seem to be getting more snow than we’ve had in recent Decembers so the road conditions might be an issue. New tires were on the list of purchases this year and they were a good idea, even for local driving during the time leading up to leaving for the trip. There were many snowfalls and some mild days. This photo has dirt on the windshield showing what kind of roads we were travelling around Kamloops. The challenges of winter driving can be a bit intimidating and watching the weather forecasts and road reports for a couple of weeks before departure day is typical at this time of year. We’d enjoyed our travel through the Thompson and Fraser Canyons last year and decided we’d go the same way this year, too. The roads are definitely winter conditions but have been well sanded and the temperature seems to be kind enough that we’re not seeing a lot of ice on these roads. Most of this day of travel, the coldest temperature we noticed was -2C (28F). The Thompson River meanders through the valley, CN and CP Railway tracks frame on either side of the river and Highway 1 follows along on the snow covered hillside. Three different routes for transportation are seen here. The contrast of the snow is showing off some of the geography we may not normally notice and creates some great photos. As we pass through Spences Bridge, we follow along at river level and see fisherman throwing their line from the cold shoreline. The Thompson River at Spences Bridge is a big fishing draw for Steelhead in the fall. Steelhead is a rainbow trout so they migrate to saltwater from freshwater streams but return to those freshwaters to spawn. Fresh snow on these rocks in the river is pretty rare to see so the camera is busy catching what photos I can as we drive by. All of these photos have been taken as we drive so I get what I can and although I am not going to get prize winning photos, they still may show the beauty of our drive. From here we begin to climb and can see some promising blue sky up ahead. The sun has been trying to peek through some of the clouds and makes the snow sparkle and shine. This just makes the day even better! Nothing like blue sky and sunshine as we head out on a great RV holiday! And look at the view we get as we come around a corner and get to the crest of the hill before reaching Lytton. The Lillooet Range Mountains are covered with snow and with the sun shining, they look spectacular. This part of the trip was so pretty with all the snow laden trees lining the highway. The sun has managed to keep the roads bare, although not quite dry but with the temperature just above the freezing mark, we are travelling on great roads. Once we pass Lillooet, BC, we are now following the Fraser River as it meanders its’ way to the Pacific. We pass through Yale, BC, which has some great history, as does the whole Fraser Canyon. Click here to see more of the history of the Fraser Canyon. As we approach Hope, BC on Highway 1, we see the clouds ahead are low and make the day dark and dreary, we now know we chose the right route. 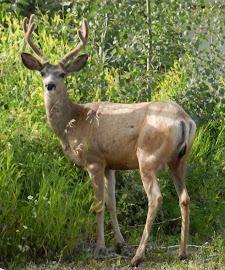 We have just enjoyed driving through the beautiful Thompson and Fraser Canyons with spectacular sights and sunshine. The roads were good winter conditions and the roads ahead are going to be just fine. The travel time for this trip that took us into Aldergrove took 5 hours from Kamloops, so that is a bit longer than taking the Coquihalla. We parked in our daughter's driveway for the night and left early the next morning to travel through Washington State. I will post some photos from that drive soon.